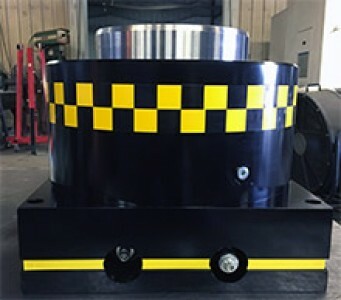 Hydraulic shock dampers are beneficial in any blanking, punching or die trimming application that is experiencing load reversal shock such as: Excessive noise and vibration Mechanical press failure Premature tooling failure W-Technologies, Inc. hydraulic shock dampers include the following features: Portable North American components Stock and custom sizes available Successful in hydraulic and mechanical presses Cost effective Our standard damper is designed with 2,600 psi internal pressure capacity (U Series) or with 5,000 psi internal pressure capacity (H Series). Individual cylinder capacity will range from 6 tons to over 550 tons. Contact our office or any representative for the recommended cylinder size for your application. We back our products with a 100% customer satisfaction guarantee. If the hydraulic dampers do not meet the customer satisfaction, all financial obligation is cancelled and returned.